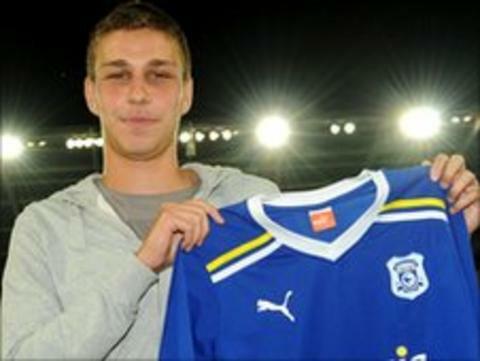 Cardiff City have signed SK Slovan Bratislava midfielder Filip Kiss on a season-long loan. The 20-year-old was a key part of the side that won the Slovak national title for a record sixth time last season. Kiss, the Slovakia Under-21 captain, could make his Cardiff debut in Saturday's friendly at Bournemouth. "In terms of professionalism and the level of football it is a different level," Kiss told the Slovan Bratislava website. "Cardiff has a 27,000 [capacity] new stadium, which is always full [and] I am looking forward [to that]. "I see this as an important intermediate step towards the 'greatest' of European football." Cardiff are also thought to be close to signing Scotland striker Kenny Miller from Bursaspor after the Turkish side accepted a bid from the Bluebirds.